How do we know if water is drinkable? While water in a lake or river may look clear, does that really mean you should drink it? Though a cup of tap water and water from a lake may look the same, tap water goes through a rigorous process before it reaches the sink to keep us safe. Drinking water supplies in the United States are some of the safest in the world. Despite this, the water is not immune to contamination by waterborne pathogens like Cryptosporidium, E. Coli, Hepatitis A, Giardia intestinalis, Legionella, Salmonella, Campylobacter, and Norovirus. Raw water from rivers, lakes, and reservoirs undergoes a rigorous process of cleaning and disinfection before it reaches homes and businesses. During Coagulation and Flocculation, chemicals with a positive charge, such as aluminum sulfide or aluminum chloride, are added to neutralize the negatively charged dirt and other particles, creating floc. During Sedimentation, this floc settles to the bottom of the supply so it can be easily removed. During Filtration, the water then passes through filters made of sand, gravel, and charcoal to catch dissolved particles of various sizes, including dust, parasites, bacteria, viruses, and chemicals. Finally, to prevent microorganisms from growing and spreading in public water systems, disinfectants, such as chlorine, are added to the water supply to lessen pathogens that amplify during storage and transport. Even though disinfectants are added to the public drinking supply, waterborne pathogens, like Legionella, can still be found all along the water supply. It is up to public water systems to strike a balance- they add just enough residual disinfectant to control the growth of as many microorganisms as possible while still keeping the water drinkable. For example, a community pool has high levels of chlorine to keep the water safe and clean. But even though it’s germ-free, would you really want to drink a glass of pool water? Disinfectants will often be consumed as they travel through the system. To combat declining levels of disinfectant, boosting stations administer additional doses to combat the diminished effect. 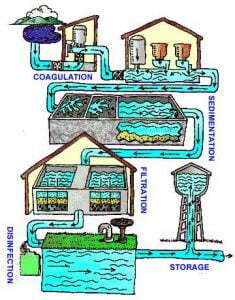 Some areas use different methods of disinfection in addition to chlorine. For example, Orange County, California, uses ultraviolet light and ozone as additional methods of purification. Despite its drawbacks, this four-step process to make raw water drinkable is vital to society, and keeps millions safe from waterborne illness.